Exit Brewing's fifth release (or #005 to give it its proper name) was well received. Yet the Hoppy Amber was – among tough competition, admittedly – a beer to us that didn't seem quite up to the standards Frase and Grum had set before and have reached since. There was something a little loose about it, as if the various parts weren't quite in sync, leading to an end product that wasn't as tight as we'd come to expect. Thankfully, they returned to the American Amber style, not as a one-off numbered release but as the second beer in their steadily forming core range. It followed the IPA and was such an enjoyable drop that a text paying compliments was fired off to Frase halfway down our very first glass. Of all beers, bright copper and amber beers are the ones that have the ability to look most enticing in the glass (well, in the Crafty opinion at least); get it right and they're the sort that get you wishing for a spot of Alice in Wonderland action so you can dive right in. This burnished copper / amber ale is one such beer and doesn't let itself down once you do dive in. Fruity hops and soft caramels play nicely together, joined on the smooth palate by a touch of spiciness. Bitterness is well judged and the flavours linger long. "Hope it sells by the truckload for you," was how we signed off. 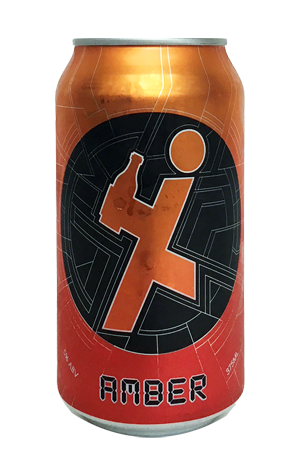 Since then, the beer has gone on to snag an AIBA trophy for Best Amber/Dark Ale in 2017 and now it's made the transition into cans too, joining it core range stablemates in the Melbourne brewers' jazzy, Tron-esque getup.